Circle sentencing aims to avoid gaol time for Aboriginal offenders by bringing them together with elders. The offender must plead guilty, and punishments are not mild. The system has many benefits for all involved. Number of circle sentences in NSW between January and September 2010. Imagine you have committed an offence and instead of going to court and jail you'll have to face a circle of elders, representatives of your community and your victim. This is the concept of 'circle sentencing'. For a long time there has been no real improvement in the situation of Aboriginal people in jail, despite the Royal Commission into Aboriginal deaths in custody and its many recommendations. Aboriginal People are over-represented in Australian jails. In 2006 (and still in 2008) 80% of the Northern Territory prison population was Indigenous. In addition, Aboriginal people in custody are often dying from treatable diseases like diabetes and heart disease. A scheme which is called "circle sentencing" in NSW tries to avoid gaol time for Aboriginal offenders. The term 'circle sentencing' stems from a circle of representatives sitting together and trying to decide a sentence which does not include a jail term. Representatives are mainly Aboriginal Elders, but also members of the prosecution or police and a magistrate. The circle will also talk about the background and effects of the offence and can involve meeting the victim. The sentence should, where possible, involve community work. Circle sentencing is only for those who admit that they are guilty. They don't avoid punishment but can avoid being locked up in jail. Circle sentencing is part of the court process and results in convictions and criminal records for offenders. Sentencing circles require a significant commitment from those community members who participate in the circle. To maximise the benefit of each circle sentencing process communities should only invite offenders who demonstrate high levels of motivation and commitment to the process. The offender must normally enter a guilty plea early in the proceedings indicating a full acceptance of responsibility for the offence. Circles are not for people facing murder or sexual assault charges. Circle sentencing is not an easy way out for offenders. Punishments tend to fall in the middle-to-heavy end of penalties. "Many Kooris who have been through the Koori Courts find the experience far more confronting than the mainstream courts," explains Rob Hulls, Victorian Deputy Premier and Attorney-General . "The Elders are imposing but, rather than being adversarial, they help get to the cause of the criminal behaviour. This model is designed to break down the disengagement that Indigenous people have had with courts." The ABC reports on New South Wales' first Koori court opening in November 2014. Welcome: Aboriginal elders welcome all participants. The magistrate will welcome all participants to the circle and formally open proceedings. Introduction: Participants introduce themselves, explain who they are, their relationship with the defendant or victim or their interest in the offence. Magistrate explains the role of the circle, that it is a court and functions as a court. Magistrate explains methods of proceeding in the circle, the guidelines and the rule of conduct within the circle. Defendant statement: The defendant will make comment regarding the offence, themselves, their commitment to rehabilitation. The victim or a representative of the victim may make a statement regarding the impact of the offence. Circle discussion: The discussion should cover the offence, its impact on the victim and community, what needs to be done to right the wrong, what support may be available for the defendant and victim. Magistrate provides summary of circle discussion/decisions reached. 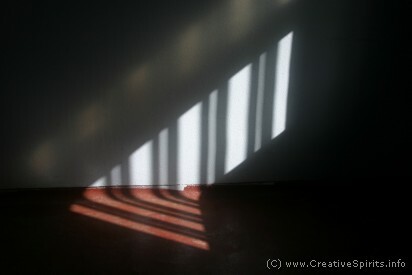 Support discussion: Support for defendant established, formal support group that will support offender is established. Support for victim established, support group for victim is established. Closing remarks, magistrate formally closes the circle. In 2002 Robert, an Aboriginal man from Nowra (about 200 kms south of Sydney), got involved in a pub fight and badly hit another person. With his previous convictions this would have put him into jail--again. But Robert had the chance to participate in the first circle sentencing court in Nowra. He accepted. Four Aboriginal elders, a magistrate, a police prosecutor and a defence solicitor listened to Robert's and the victim's version of what had happened that night in the pub. Robert learned about how terrifying the experience was for the victim and felt remorse. The elders asked Robert how jail would feel—three months would be the usual sentence. The victim felt it was too much. Eventually the sentencing circle court handed down their decision: Robert got six months' home detention . 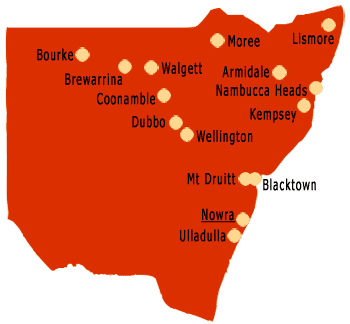 Circle sentencing locations in NSW. The pilot program ran in Nowra. The selection of the locations was based on criteria that included the number of eligible Aboriginal defendants appearing in the Local Court, the number of Aboriginal defendants being sentenced to a term of imprisonment, Aboriginal community support for the program and local service infrastructure. Later circle sentencing locations were established following consultations with Aboriginal communities. Koori Courts in Victoria now operate at Bairnsdale, Moe/Latrobe Valley, Shepparton, Broadmeadows, Mildura, Swan Hill and Warrnambool . 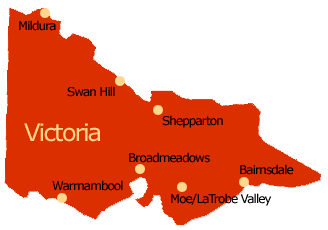 Victoria's first County Koori Court launched in November 2008 at the Latrobe Valley court complex in Gippsland. It is the first higher jurisdiction in Australia. Magistrate's Koori Courts operate already around Victoria (see map) and Children's Koori Courts are in Mildura and Melbourne . The County Koori Court will sit once a month while the Magistrate's Koori Court sits once a fortnight. The Shepparton Koori Court has a reoffending rate of about 12.5%, Broadmeadows reported 15.5% while the general court system has a rate of over 29% . In November 2008 there were about 120 elders in Victoria's court system, in addition to about 60 Aboriginal people in the state's Department of Justice. The Nunga Court in Port Adelaide, South Australia, celebrated its tenth anniversary in June 2009 after hearing more than 5,000 cases . The court was the first of its kind in Australia. "It has been so successful the rest of the nation has followed our lead and introduced similar court set-ups interstate," explains Michael Atkinson, South Australian Attorney General . South Australian Nunga Courts operate at Port Adelaide (since June 1999), Port Augusta (2002), Murray Bridge (2001), Port Lincoln, Ceduna (2003) and a pilot program running at Berri. 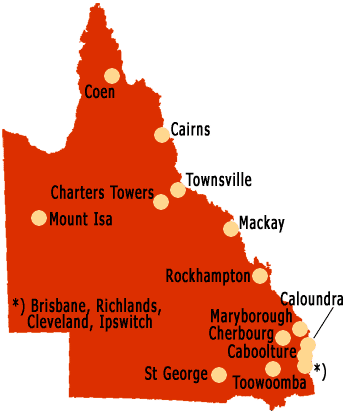 Murri Courts in Queensland operate in 17 locations. The Murri Court, established in 2002, usually is a Queensland Magistrates or Children's Court. Western Australia's only Aboriginal court opened in Kalgoorlie  in November 2006. A more informal court operates at Norseman, near Kalgoorlie . 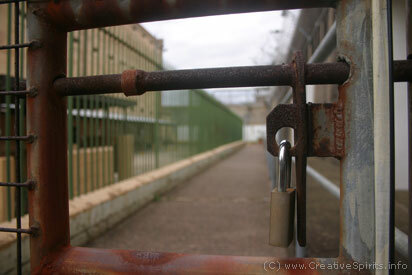 Local scope: Circle sentencing helps people to address and correct criminal behaviour within their local communities. Break the cycle: It reduces the likelihood to re-offend and enter a criminal career. Personal hearings: There is no dominance of legal professionals or hierarchies of traditional court rooms, all participants are able to fully participate and to speak for themselves. Easy understanding: Legal jargon is removed from the court, the language of the community becomes the language of the court. Holistic approach: The court receives information about the whole community, the background to the offenders, the impact of the offence on the victim, the problems experienced by the local community. Racial bias reduced: Community participation greatly removes racial bias in the court and in the sentence. Offender participation: Circle courts actively encourage the participation of the offender and those who know him or her best. Victim participation: Circle courts allow the offender to get a full perspective of the effects of their actions on the victim, the offender is directly confronted with the hurt experienced by the victim. Away from court rooms: Court rooms can be intimidating for Aboriginal people. If circles are held away from courts people are more likely to open up to elders. There is widespread agreement that Koori Courts in Victoria, Murri Courts in Queensland and circle sentencing in New South Wales facilitate culturally appropriate ways of proceeding with young Aboriginal offenders . They also have a beneficial flow-on effect for the wider Aboriginal community where people "feel as if they are being treated seriously and having their culture respected,"  which might be the most important effect of these courts. Circle sentencing has many benefits which help Aboriginal offenders to avoid prison but not punishment. But the number of elders available for circle sentencing is dwindling. Robert B. of Nowra, the first to go through a circle, despite at least eight previous custodial terms, had not re-offended sixteen months later . Only 4 of the 50 offenders sentenced in the circle court have re-offended in Dubbo. 10 out of 37 offenders have re-offended in Nowra. The numbers of Koori offenders appearing on list days at Nowra Local Court were reduced from 23% to 6%. Re-offending rates dropped by 15.5% in one Victorian town . One victim, the proprietor of a motor vehicle shop in Nowra, sponsored the local Aboriginal football team after his involvement in the program as he recognised the potential of such activities for reducing the likelihood of Aboriginal offenders re-offending. Although some data indicates that circle sentencing reduces recidivism rates, other reports found little or no improvements compared to ordinary courts . Circle sentencing works well for individual offenders, but if many community members are involved in an offence, such as during a riot, the system is less appropriate. In that case it might also be hard to find elders to sit on the court who are impartial . The fact that people entering the circle sentencing system have to plead guilty is also a matter of concern. Critics demand that instead the crown should establish a person's guilt or innocence. The circle sentencing system should not be a "cosmetic adjunct" to the court system . A 2008 analysis of the program using a small sample group of offenders found that the process did not address the root cause of the offenders' criminal behaviour, such as drugs and alcohol. In 2007 SBS television broadcast a six-episode mini-series about a circuit court, set in Broome, Western Australia, which is available on DVD. The award-winning series explored the daily work of a court lawyer who has to travel vast distances to deal with cases in remote communities. Read about the six 2008 episodes of The Circuit. The Judicial Commission of New South Wales has produced Circle Sentencing in NSW, a DVD primarily designed as an educational tool for judicial officers but also useful for other participants in circle sentencing, including police prosecutors, defence lawyers, project officers and Aboriginal elders. It explains how circle sentencing works, how to go about it and its benefits. You can order the DVD on the Judicial Commission's website.